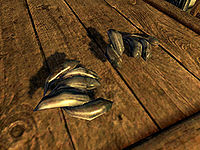 Bear Claws are dropped by bears, in addition to a bear pelt. In terms of combinations of two ingredients, Bear Claws can be combined with 41 other ingredients. Bear claws are dropped by all varieties of bear, including cave bears, snow bears, and the Ursine Guardian. This page was last modified on 12 February 2019, at 23:29.